An EU Twinning project aimed at modernising Ukrainian interior troops has come to a close: its final ceremony, held on Jan. 31 in Kyiv, focused on its achievements and future joint work. 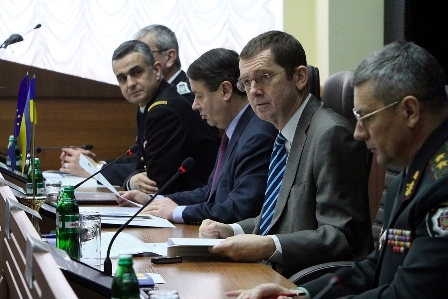 EU Member States France and Romania led the €1.55 million project to help improve the efficiency of the interior troops of Ukraine’s Ministry of Internal Affairs. Focusing on protecting public order and observing citizens’ rights and freedoms, the project surely contributed to calm and almost accident-free EURO 2012 tournament. 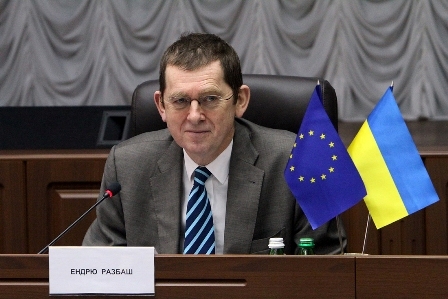 According to Andrew Rasbash, head of operations of the EU Delegation to Ukraine, Twinning is a “useful, direct and highly efficient tool.” It brings the best EU experts to work with their Ukrainian partners in a very informal and “confidence-building” way. 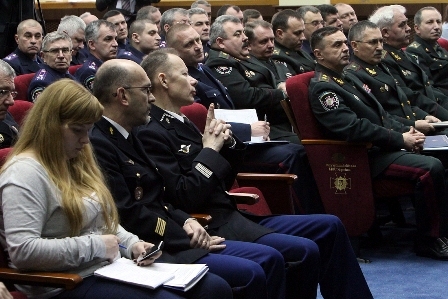 The initiative boosted “bottom-up” changes, introducing new elements to the interior troops’ tactics: skills of maintaining order in a soft manner, techniques of restraining a person without beating, of balancing action and reaction, and of coordinating efforts between different law enforcement services (especially during mass events) in line with the EU practices. About 100 public order specialists from France and Romania visited Ukraine to transfer their skills to their Ukrainian colleagues. A total of 240 Ukrainian interior troops instructors took a fresh look at tactics for maintaining public order, particularly during mass events like EURO 2012 football games. Nearly 200 of these instructors received certificates and are qualified to spread European know-how to more “field” staff. In addition, the Twinning also helped develop necessary amendments to legislation and internal instructions and regulations. Stanislav Shulyak, lieutenant general and commander in chief of Ukraine’s interior troops, argues that the project’s achievements, “are now used as a foundation for reforms.” “At the moment, we are trying to improve modes and methods of work on maintaining public order,” he adds. Ceremony participants agreed that the Twinning tool helps move reforms in Ukraine forward. Significant changes to the Ukrainian law enforcement system are important to the journey toward Ukraine’s EU integration. They will enhance the maintenance of the public order while improving protection of citizens’ rights and freedoms. Twinning projects bring together public servants from Ukraine and EU Member States (MS) to share expertise and best practice and work toward agreed-upon goals. The Ukrainian institutions, together with an EU Member State civil servant (Resident Twinning Adviser (RTA)) based in the institution, run workshops, training sessions, expert missions and counselling to improve management, citizen services and legal frameworks, modelling them after good European practices.